I recently celebrated my birthday, and one of the most memorable greetings came from quite an unexpected source: the business social networking site Xing. I received an e-mail informing me that they are giving me 10 days of Premium Membership. 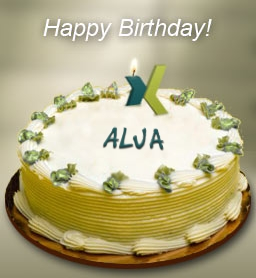 That in itself is a nice touch, but what really brought a smile to my face was the picture of a Xing cake with my name on it that was attached to the message. Technologically speaking, it was nothing special; it’s quite simple to program a piece of software that does this for every member’s birthday. But still; Xing took the time to think of a special way to wish their members a happy birthday, and it certainly worked for me. I confess that I don’t even use Xing regularly, but this simple gestures has increased my appreciation for the site. An unexpected and original display of affection can certainly go a long way. Can you remember when was the last time you tried to do something different, unexpected, something personal for your customers/students/friends?